How to jump directly to a filename and line number given in a text file. 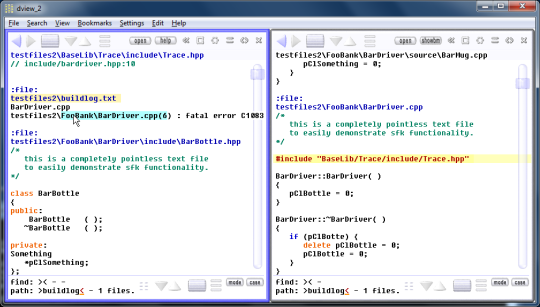 on screen by a single key press, with a Freeware tool for Windows and Linux/Mac. in log files or some redirected error output. -  extract the filename and line number. it searches the matching file nearest to source. of the first matching file. the trace mode, by a CONTROL+click on the message log button. any filename containing the word. identical text, like two versions of a project. The first view has a PATH mask set like "myproj1". The second view has a PATH mask set like "myproj2". The first view shows a file "foobar.html". to the same line number as in the first view. the CTRL+X feature highly useful with output of those compilers. With all files loaded in DView. 1. right click on "Setup" to edit the config file. 6. reenter DView. the changed config file should be loaded automatically. 7. Open / Append the file "C:\project\zz-err.txt" . 8. Make sure you have at least two views open. If not, right click on blank space to create another view. activate the right side view, then press F9. to let the right side view jump to the error location. with nearest meaning in the sequence of loaded files. to load everything in the best sequence.